*500,000 times larger than our national debt. – A 12 always beats a 5. 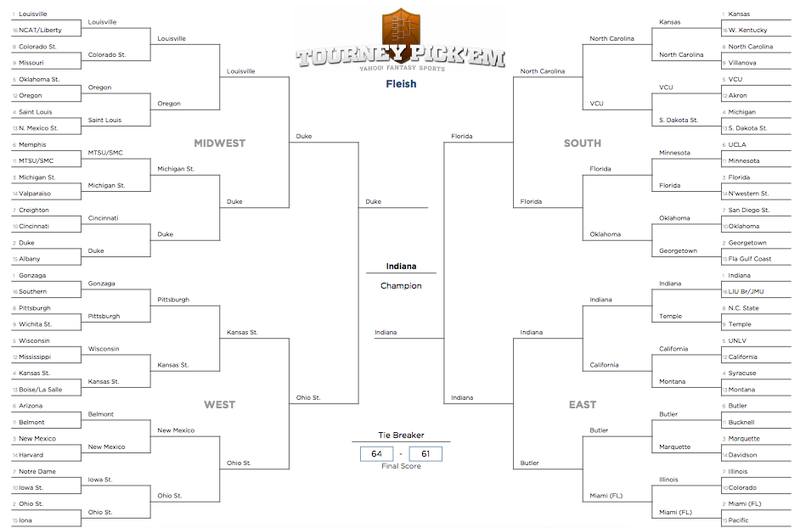 This year I like Oregon (the Pac 12 champion) and Cal to advance to the Round of 32. – My biggest upset is #13 South Dakota State over #4 Michigan in the first round*. Michigan started the season 20-1 and was ranked #1 a few months ago, but they have lost 6 of their last 12 games. Also, I correctly picked a Michigan upset last year, so I thought I would do it again. *The NCAA now refers to the four play-in games as the ‘first round’ and the Round of 64 as the ‘second round.’ So technically this is the second round. Even though it shouldn’t be. – I also have Montana beating Syracuse. Why? I don’t know. – Other first round upsets: St. Mary’s over Memphis, Belmont over Arizona, Iowa State over Notre Dame, Cincinnati over Creighton, Oklahoma over San Diego State, and Minnesota over UCLA. – A handful of 1’s and 2’s lose in the Round of 32 each year. I don’t see Gonzaga, Kansas, or Georgetown reaching the Sweet 16. – There’s still something magical about Butler. I have them in the Elite 8. – Duke has only lost once with Ryan Kelly (to Maryland, last week). I think they’re the best team in the Mid-West Region and have them in the Final 4. – Ohio State won the toughest conference in college basketball this year, and they are better than Gonzaga. I think they’ll be in the Final 4. – That said, I have another Big 10 school winning it all: Indiana. I have always had a soft spot for the Hoosiers. I think this is their year. The next few days are some of my favorite of the year. 10+ hours of college basketball each day that will inevitably feature buzzer beaters, upsets, and crazy finishes. Maybe one of them will top my favorite game of all time.